The ACLO Wants to Hear From You – Take a Brief Survey! 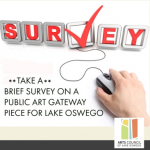 The Arts Council of Lake Oswego (ACLO) wants to hear from you! Help shape the future of Public Art in Lake Oswego by taking this brief survey. The Arts Council of Lake Oswego is putting its Public Art Master Plan to work and embarking on a monumental gateway sculpture at Highway 43 and Terwilliger Boulevard. This preliminary information will help them design a longer survey to inform artists about this sculpture and Lake Oswego. The survey will be distributed throughout the community, so please feel free to share this link! This gateway is one of a number of projects planned to distinguish points of entry into the City of Lake Oswego. The Arts Council of Lake Oswego works to ensure that arts are an integral part of life in their community, now and into the future. They manage the city’s art collection, including an indoor and outdoor permanent collection as well as a rotating exhibition of outdoor art on-loan from artists. Come check out what’s on view in their ARTspace gallery! I read this article and found it very interesting, thought it might be something for you. The article is called The ACLO Wants to Hear From You – Take a Brief Survey! and is located at https://clackamasartsalliance.org/news/the-aclo-wants-to-hear-from-you-take-a-brief-survey/.